LOS ANGELES, CA (March 22, 2018) – BOOM! 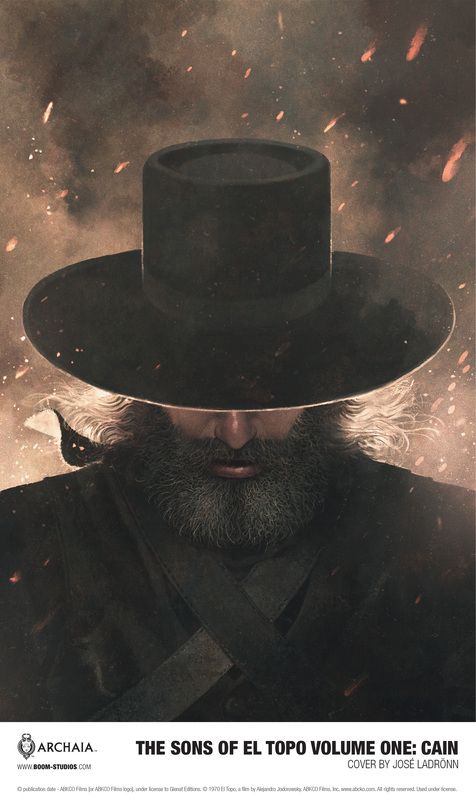 Studios is proud to announce THE SONS OF EL TOPO VOLUME ONE: CAIN, a hardcover original graphic novel from legendary filmmaker Alejandro Jodorowsky and virtuosic illustrator José Ladrönn, arriving in stores December 2018. This sequel to the 1970 Mexican Acid Western film written, scored, directed by and starring Alejandro Jodorowsky himself, tells the story of El Topo—a bandit without limits and a man with no moral compass. But when his journey through the arid west brought him face to face with a series of rogue outcasts, he found enlightenment in the unlikeliest place and was forever transformed, becoming a holy vessel imbued with the power to perform miracles. This was a journey that took him far from his first born son, Cain, and brought about the birth of Abel.